Cycling in a Winter Wonderland? 2. Insulate your toes with Toe warmers or wear shoe covers. 3. Use a Base Layer next to skin to vent and insulate with thermal fleece. 5. In very cold weather add leg and knee warmers give an extra layer of warmth. Whether you're a seasoned cold weather rider or you're simply looking to extend your riding season farther than last year, properly layering your clothing is essential. Here is a complete guide to starting warm and comfortable in the winter time while cycling. Aero Tech offers a full line of cold weather cycling gear for men and women. The art of properly layering your clothing takes some practice to perfect your approach, but you'll be thankful once you've achieved an understanding of what works best for your body. Everyone's cold tolerance, perspiration levels, and specific needs are different (for example, "My hands are always cold," "Cold wind gives me headaches," and "I sweat so much that riding in the winter just makes my whole body cold") so learning how to listen to your body and how to be prepared for a range of temperature levels will go a long way in helping you ride comfortably year round. We're all familiar with the idea of layering clothes to prepare for cold weather. As temperatures drop around the country we thought it would be helpful to lay out a couple of cycling-specific fundamentals on layering. Certain things are important to keep in mind when you're preparing for an activity like cycling where varying perspiration levels, temperature changes, and the other effects of a cold weather climate can conspire to make your ride miserable. Things to Consider: As you ride, you're likely to go through stages that require more exertion at times and, in turn, this will cause you to sweat more during some stretches than you will during others. It's important to be prepared for this because sweat that is generated and not removed from your body will chill and ultimately bring your body temperature down. A good foundation to layering is a moisture-wicking base-layer or long sleeved jersey. With this approach, moisture that is generated will move away from the body where it will have a chance to evaporate or vent rather than cool down against your skin. On top of this layer you have a few options. It is important to take as many variables into consideration as you can, including: Your personal cold tolerance: How long you'll be riding for? Will the sun be coming out mid-ride? Type of ride: casual, commuting, training ride, etc. The terrain ahead: mostly flat, several hill climbs, multiple descents, etc. Each variable can impact the ride differently and the best you can do is to be prepared. You will expend energy (and, in turn, body heat and sweat) to climb, whereas on the upcoming descent you will chill down quickly. If your route includes these types of extremes, be prepared with a full-zip outer layer that blocks wind. This way you can unzip it for the climb and vent out as much sweat as you can before you zip it up partially or fully on the downhill to keep yourself from chilling down too much. On the flats you can vent yourself appropriately to get a good balance of air flow and insulation. Jackets and mid-weight long sleeve jerseys can be used as your outermost layer, depending on the conditions of the ride. Jackets and windbreakers work great to repel water and block wind, though they may not breathe as well as a mid-weight jersey will because they're designed to block the transfer of wind and rain. To counteract this, make sure you choose a jacket with plenty of ventilation options, including a full-length front zipper and additional options like zippered armpits or a shoulder ventilation slot. These things give you more control over how much airflow you want to allow. 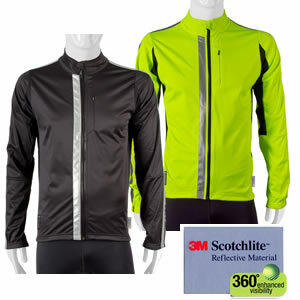 Mid-weight jerseys generally aren't as strong against rain and wind but they insulate and breathe very well so pairing a layer like this with a base-layer that is equally effective at moisture transport can be a good solution if you're not going to be in too much wind or rain. We've all heard that so much heat loss occurs through our heads in cold weather so it only makes sense to target the area above the shoulders first. In truth, this phenomenon may be more closely tied to how the rest of our body is dressed, but it still shouldn't be ignored. Helmet liners and knitted beanies act as a soft, fleece barrier underneath your helmet that insulates your head and wicks away moisture that can then escape through your helmet vents. Alternatively, helmet covers add an extra layer outside of your helmet to block wind and serve as a protective shell against cold air. There are various configurations of thermal head covers that vary in the added warmth. We have neck warmers, head bands, full balaclavas and face protection. The neck warmers insulate the front facing the wind and can be pulled up over the nose and face for added protection in icy cold weather. There is a commonly known myth that your loose 40% of your heat through your head (quoted by the US Army based on research in the 1950's). The reality in the most recent research based analysis by the British Medical Journal is approximately 8% heat rate loss through the head. It is the ears, nose and skin on the face that cause the most discomfort in frigid conditions. Additionally, balaclavas, ear covers, and other accessories can also be used in tandem to cover your face, nose, and mouth. Plus, balaclavas provide some additional flexibility and can be pulled down to expose your mouth and nose if you need some extra ventilation or if the temperature ticks up a bit mid-ride. Leg warmers are a great option for several reasons. They are lined with fleece, block the wind, fold up easy mid-ride as the temperature warms, and, of course, they span the gap between your quads and your ankles to convert your favorite warm weather shorts into a viable cold weather option. 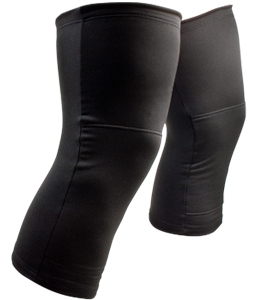 Leg warmers accomplish all of this while also adding a welcome element of muscle compression to your extremities. Additional features like ankle zippers shorten the time between the end of your ride and a nice warm shower by making it easier to put the warmers on and take them off. Other common features include tag-less labels and silicone leg grippers that act to keep the warmers from sliding down during each pedal stroke. The wicking polyester/spandex blend transports moisture away from your body while insulating your skin. Whether you're bombing down a descent or fighting a headwind on level ground, your hands are front and center in the path of the wind and cold. Full finger gloves with windproof shells and fleece liners are useful because they block the wind from the outside while also working to wick moisture and insulate from the inside. Depending on your climate and sensitivity, there's different styles to choose from that vary in thickness and insulation level. Cycling naturally relies on your bottom half for most of your power but your feet don't necessarily benefit from that heat-generating motion the same way that your quads and calves do. Shoe covers worn outside of the shoe and toe covers. If you know that you’ll be riding in cold weather, make sure to choose a pair of winter cycling gloves that will keep you warm and in control. 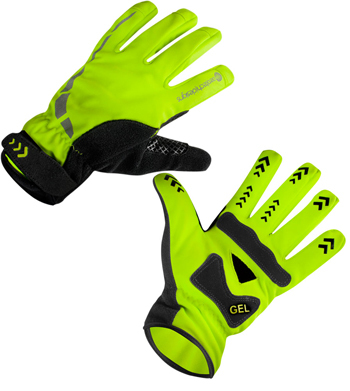 Often these cycling gloves include fleece linings and insulating materials. A lobster-claw-style cycling glove is ideal for winter commutes, as these cycling gloves group your pinkie and ring fingers together for warmth, and your index and middle fingers for freedom to work handlebar controls. There are a few types of cycling gloves, depending on how cold it is. Liner gloves insulate and wick moisture and are often made from wool or polypropylene. The thermal gloves are often fleece and ideal for chilly weather. The warmest are insulated and have a windbreaker surface. This is ideal for cold weather. In frigid weather, the entire glove needs to be windproof. The area around the thumb that is used for a wiper can leak cold air in frigid temperatures. When the weather is frigid, as soon as your fingers get cold, you might want to end your ride. To keep riding longer and feeling stronger, you will need the right winter glove for the temperature outside. Make no mistake about it, a good pair of cycling gloves will undoubtedly give you a better biking experience and keep you safe, whether you’re riding miles on paved roads or splashing through mud on the side of a mountain. 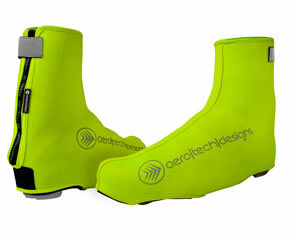 Aero Tech Designs Shoe Covers worn inside the shoe between the shoe and your socks seek to ward off numbing chills and uncomfortable feet. 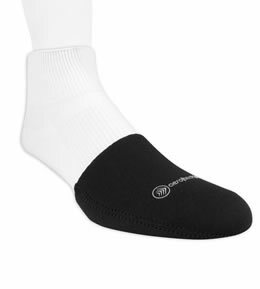 Often made of neoprene or a polyester/spandex blend for insulation, they work to block wind and keep your feet warm. Additional elements like reflective features and easy on/off ankle zippers are standard features as well. To be most effective, you'll find that your combination of clothing may change somewhat from ride to ride so be prepared for a little trial and error. The important thing is to listen to your body and be prepared to add and remove layers as you ride. Many items (gloves, warmers, shoe covers, some windbreakers) can be compacted small enough to fit in a rear jersey pocket if need be. If you don't like that approach, small panniers, rear rack bags and handlebar bags are unobtrusive and can be used to stash away some of your "just in case" items should you need them. I also recommend keeping the "10 Minute Rule" in mind while riding in the cold. It's no surprise that your system can get quite a shock from stepping outside decked out in technical fabrics like polyester, nylon, and spandex but do yourself a favor and ride for 10 minutes or so before adding any layers. You don't want to be overdressed to the point that you'll start sweating quickly into your ride before you put out too much effort so try dress in a way that will be comfortable after that initial shock wears off. You may feel slightly under-dressed at first, but don't forget: you're going from zero movement indoors to exertion outside in the cold. If you still feel cold and under-dressed after 10 minutes then re-evaluate your clothing and stop off for a minute to add the necessary item. Perhaps something as simple as a helmet liner or thicker glove is all you need. To keep warm for winter cycling, you just need some experimentation with your layers and equipment. Create more joy in you life...do some winter cycling. Don't tuck the bike away just yet. Here are some tips and tricks from our winter time riding pros here at Aero Tech Designs. Hopefully you can get out this winter and have some fun on two wheels! 1.) Trainer or Rollers: These are the best way to keep the training in your comfort zone. With a trainer (sometimes called a turbo trainer) or rollers you are free to set up your favorite movie or cycling video. I personally like to watch cycling on the trainer, it helps to stoke the fire for the next season and also you can pick up great tips or form. Deciding between rollers or riding the trainer is a personal preference. Some riders prefer the read road feel of the rollers and mental engagement that it requires. Rollers can be harder to perform sprints or hard force efforts unless you have a unit that offers resistance or a fork stand. On the other hand, the turbo trainer requires little mental concentration but can lack the feel of riding a bicycle. The trainer allows you to zone out and get a good work out while watching a show or listen to music. Another benefit is the stability and resistance of most trainers. This stability is great for sprints and hard efforts. The rider can concentrate on the work out instead of staying on the rollers. 2.) Spin Class: We've all seen it; an instructor with a headset on barking orders at sweating, pain faced riders. Welcome to Spin Class. A spin class is the perfect way to keep your riding fitness through the winter and work some different muscle groups. The condensed format of a spin class makes it perfect for the person who wants to get a great workout in a small amount of time. Spin classes mimic the efforts of cycling and even offer the feeling of real world riding with SPD compatible pedals, so you can use your regular riding shoes. If you haven't tried a spin class I highly recommend it. Just come prepared with some water, a towel, and be ready to work out! 3.) Bundle up: It's not like we stay inside our houses all winter right? So why can't we just add some extra layers and get outside and ride? Right! Having the correct gear can turn your winter frown upside-down. Remember to layer properly and dress for the occasion; if you're hitting the road for a ride wear wind proof garments. Head winds on the road can be downright painful without ear and face protection. If you're in the woods you will want to be ready for slush and mud. Wearing waterproof shoe covers and gaiters are a great way to keep your feet warm and dry. Fleece can be better than wind proof gear in the woods because you're not encountering much head wind and you can over heat quickly on climbs and hike-a-bike sections. Always remember to carry chemical hand warmers just in case! 4.) Fat Bike: A Fat Bike is an excellent choice for enjoying the winter weather. Fat bikes, for those who are unfamiliar, are bicycles with 4-5 inch tires that are designed to be ridden in snow and sand. Fat bikes can be seen all over the trails, not just in the winter time, and that's what so great about riding one. Just take a few pedal strokes, and I guarantee you'll have a smile on your face. You'll be looking for the closest trails. Since fat bikes can tip the scales at 30 plus pounds be prepared for a work out. 5.) Move somewhere warmer: So, this an option too, but let's look closer into it. *Average price of a stationary bike trainer $150.00 including magnetic resistance and riser block for front wheel. *Average price for Spin Class at the local gym or YMCA $25.00 drop-in rate, free water included. *Average price for winter cycling gear total package from Aero Tech Designs, about $500.00 covering you head to your toe covers. *Average price of a Fat Bike at your Local Bike Shop $2,000.00. This would be a quality fat bike build for the long haul and many winters to come. I would personally look into some winter riding gear and a Fat Bike for maximum fun!